Preheat oven to 425°F. Cover a large baking sheet with parchment paper. Melt 1/2 cup butter. Set aside to cool. Form biscuits from 1/2 cup dough each - it will be sticky and hard to shape. Bake for 10-12 minutes or until just golden brown. 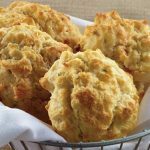 While biscuits are baking, melt remaining 1/4 cup butter, add parsley, and stir. As soon as biscuits come out of the oven, brush with parsley butter mixture. Everyone who wakes to confrontation and crisis – whether you picked the fight or the fight picked you – has an important choice: which weaponry will you choose? … I felt compelled to choose a different kind of weapon: joy. — Margaret Feinberg , Fight Back With Joy: Celebrate More. Regret Less. Stare Down Your Greatest Fears.